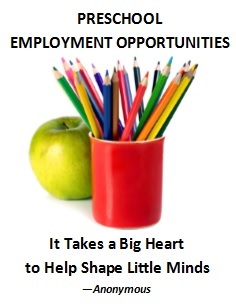 We are currently seeking a FULL TIME ASSISTANT PRESCHOOL TEACHER/FLOATER. We provide benefits to full-time employees including, competitive salaries, paid time off, paid holidays, matching (3%) 401K retirement plan and tuition discounts for staff with children. We are a Play-Based Preschool in Orinda offering a developmentally appropriate curriculum to 48 children ages 18 months to 5 years. Our curriculum is literacy based and intentional. In summary we believe that all curriculum starts with a quality picture book followed with activity choices that are intentionally integrated and well planned. That does not mean that children do not have free choice as we are a play based preschool. Each day the teacher plans activities based on children’s interest and supports their play. Our curriculum incorporates the California Preschool Learning Foundations and Desired Results Developmental Profile. During each day we cover the following areas in our daily activities; social emotional, language and literacy, cognitive and math, visual and performing arts, history, social science and science. Teachers record anecdotal notes and create individual portfolios for each child in their care. Applicants must have at least 12 units in Early Childhood Development, AA Degree preferred. Applicants must also have completed CPR & First Aid, have a current live scan clearance and be willing to continue their education. If this description of our program sounds like something you’d be interested in then please email me back and we can set up an interview.